I haven't been keeping up on my blog lately (or projects in general until recently), but I have a good reason! For the past year and some change I've been working hard on projects and learning as much about development as I can with the intent of finding a development job to start my programming career. After a lot of studying I felt I was ready and started applying around. One of the resources I used, in addition to LinkedIn and job posting sites, was Hired.com. Hired.com is a recruiting platform that focuses on providing experienced and capable developers, who qualify through Hired's testing and screening process, a recruiter and a large selection of companies to be exposed to. The idea is that after setting up your page and having your recruiter improve it, they open your page for a short duration to hiring companies and actively promote you. Upon finding an interested company, an offer by the company will be made and you begin the interview process with them. After going through a couple companies, I was matched up with Frontline Technologies that, after interviewing with, gave me an offer and a great opportunity in Chicago. I took it and started working there back in September. So far, I feel very fortunate to have gotten this job. The company has a management approach called "servant leadership", meaning that management exists to support its employees, and the company focuses very hard on the happiness of its employees as a means to increasing productivity. I'm very happy with my job and my co-workers are great; I am very lucky. While I began working there using .NET and Visual Basic on one of their web applications (SaaS), I was able to be put on a greenfield project implementing web APIs for the backend of a new web app using Web Api 2 (C#) for ASP.NET. So far things are going great, and my team is an amazing group of developers. I have a lot to learn, and thankfully my teammates have been very helpful in that regard. Overall my skill as a developer has skyrocketed since I started my new job and it's exciting to see how much I can do now. I can't wait to see what I learn and accomplish in the future. Recently I started working on a Chrome extension for Reddit (which you can find here), and I hit a bit of a snag as far as getting it started. After some googling and random stack overflow pages, I was able to get going, but for those who just want to skip the homework, below is a quick guide to get you going. First, setup a directory and create some empty text files named "onLoad.js", "manifest.json", and "script.js". The manifest.json file is the configuration for your chrome extension. The following manifest is setup to load your script, "onLoad.js", on all pages. The injected script is "script.js", and it is added to "web_accessible_resources" so that it's allowed to be used. Finally, make sure to use manifest_version 2, which is the latest version (1 is deprecated). We're almost done, all that's left is to define our script and load the extension into Chrome. For now we'll do something simple; we will change the background of every page to red. Finally, lets install and test this extension. Follow the following steps. 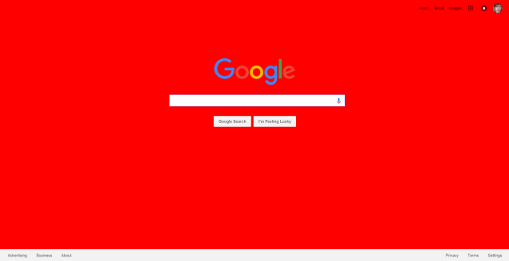 Now that the extension is loaded, go to google.com and see the background change to red. Good job!